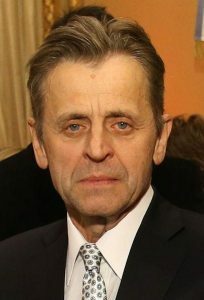 Photo: Mikhail Baryshnikov, a ballet dancer, was born in Riga, Latvia in 1948. Photo taken by Embajada de EEUU en la Argentina accessed on Wikimedia Commons. Latvia is a small country in the Baltic region of Northern Europe. It is bordered by Estonia, Lithuania, Russia and Belarus. Livs (also known as Livonians) and Latvians are the indigenous people of Latvia. In 2011, Latvia was populated with 62.1% ethnic Latvians, 26.9% Russians and the remaining 11% were of various ethnicities. Latvians are genetically very similar to Finno-Ugric-speaking Estonians. The United States and the United Kingdom have the largest Latvian population outside of Latvia. The Latvia population data represent DNA samples from 500 randomly selected individuals from Latvia. Samples were provided by the DNA Analysis Unit of the Forensic Service Department of the State Police of Latvia. Source Publication: Population data for 15 autosomal STR loci from Latvia, International Journal of Legal Medicine, 2015, 129, p739-740.